gate and remain within designated boundaries”. Height, 100 Ton Max Work Piece Weight, 120Hp Table Drive, $387,000 Replacement Value. at 90 Deg, Travels “X”=78.6”, “Y”=70.8”, “Z”=66.8”, “W”=19.3”, 4.33” Spindle Diameter. 50-Taper Spindle, 4 ½” Spindle, 55” x 63” Table Indexing at 1 Deg, Hand Wheel. Degree Tilt on both “A” and “B” Axes, Flow Waterveyor System, Flow Abrasive Hopper. @ 10” min to 24” max Diameter. Chucks (Front and Rear Headstock), Coolant. Follow Rests, 8” 3-Jaw Chuck, 5C Collet Closer, Coolant. (8) Acco and Abell & Howe 4-Ton Wall Mounted Jibs w/ Electric Hoists. (8) Acco and Abell & Howe 2-Ton Wall Mounted Jibs w/ Electric Hoists. CM 4-Ton Cap Electric Hoist. CM 2-Ton Cap Electric Hoist. IRD Large Capacity Balancing System w/ IRD mdl. 290 Controls, Upgraded (1991) Balancing Heads to 28,000 Lb Cap. 2007 Zodiac Hurricane 21’ Hard Bottom Inflatable Boat Hull # USXDCAASG7J708 w/ Center Console, Yamaha F150TXR Four Stroke 150Hp Outboard Motor, 2007 Venture Trailer Lisc# 4JU5561 VIN # 47GBM19127B000057. Buffalo No. ½ Power Bending Roll s/n 83500871 w/ 7” Rolls. Vacu-Blast Enclosed Sand Blasting Booth w/ 13’ x 33’ (Approx) Footprint, 11’ Thru Door Cap, Rail-Car Transport System. Herman Klob mdl. HK105 24” Column x 72” Radial Arm Drill w/ 15-1000 RPM, Power Column and Feeds, 50” x 99 ½” Base Area. Hansford / Davis mdl. 15 Broaching Machine s/n 15-845.Cammann mdl. C-35 SQSS RC Metal Disintegrator s/n 1509. OTC mdl. 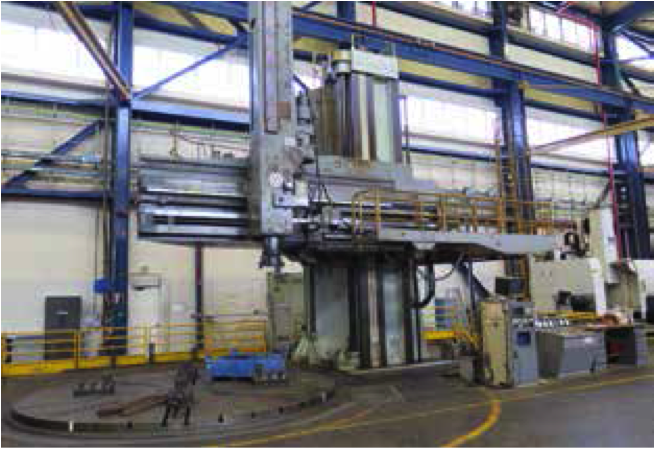 SPF100 100-Ton Sliding Ram Hydraulic H-Frame Press s/n 1093. OTC Rolling Bed Sliding Ram Hydraulic H-Frame Press s/n 40258. K.H. Happard Style 23APC1FOT Electric Furnace s/n 73. Rockwell Variable Speed Pedestal Drill Press. Micro Air Portable Fume Collector. Ampak “Shipmate TP” 18” x 24” Vacuum Packaging Machine. Epoxylite mdl. VPI-300 Vacuum Pressure Impregnation System s/n 146 w/ Process Chamber, Storage Tanks, Pumps and Controls. Proceco mdl. HD-88-108-G-10000-CO-2 Washing System s/n 092-93 w/ Proceco Controls, 1400 Gallon Cap in Stage-1, 400 Gallon Cap in Stage-2, 10,000 Lb Cap Turntable Weight Cap. Entek / IRD Electronic Balancing System w/ IRD mdl. 290 Controls. Vacu-Blast Corp Blasting Booth w/ Waffle II Floor. Bayco Gas Fired Industrial Walk-In Furnace. Steelman mdl. 333EIF 450 Deg Industrial Oven s/n 93105. Steelmman mdl. 466ETC Electric Bake Oven s/n 81202 w/ 450 Deg Max Temp, 36.75 kW. EFD Minac 50 Mobile Induction Heating System w/ μC- System. Elva Induksjon Induction Heating System. Samatic mdl. 2480 Automated Random Coil Winding Machine. 1999 Ramsome mdl. 150-RPM Turning Roll s/n 990360. Phoenix Technologies mdl. CL-125 Core Loss Tester s/n 97-242. 1997 Phoenix Technologies mdl. MTS1500R-450 High Power Motor Test Set s/n 97-244. Hipotronics Circuit Breaker Test Set. (3)Sidney No.4CW Coil Winders s/n’s 9858, 9856, 9168 w/ Tailstocks. Standard Coil Winder s/n 25-18813 w/ 5-75 RPM, Tailstock. Pneumatic and Solid Coil Winding Arbors. Tooling, Completely wired for lighting and electrical. 40’ Trailer Lisc# SE542550 w/ (6) Equipto Tooling Cabinets, Storage Shelving and Racks, Pneumatic and Power Tools, Impact Tools, Hoists, Rigging Hooks and Slings, Drills, Taps, Dies, Broaches, Hand Tools, Starrett 0-24” OD Mic Set, Completely wired for lighting and electrical. 2002-2003 Haefely Basic Impulse Generator Test System (Lightning Strike Simulator) w/ 2.4 Million Volts, 50kJoules, Digitizing System, Control Bench, Charging Reactor, Chopping Gap, Measuring Divider with Digital Readout. MSO Type FH30 13 ½” x 58” Cylindrical Grinder s/n 25761 w/ Sony DRO, Motorized Work Head Hydraulic Tailstock, Coolant. Blanchard No. 27-48 Rotary Surface Grinder s/n 12680 w/ 48” Electromagnetic Chuck, Coolant. (2)Baldor 2Hp 12” Pedestal Grinders. Jetline SWC-5LC Side Beam Welding System s/n 83669 w/ Miller Dimension 652 CC/CV-DC Arc Welding Power Source s/n LB036397 w/ Miller HF-20-1WG High Frequency Arc Starter. Miller Syncrowave 350LX Arc Welding Power Source s/n MA290553L w/ Cooler and Cart. Miller Maxstar 300DX Arc Welding Power Source s/n LB195725 w/ Coolmate-3 Cooler, Miller TIG Runner Cart. (2)Acorn 60” x 72” Forming Tables. (2)Acorn 30” x 60” Forming Tables.